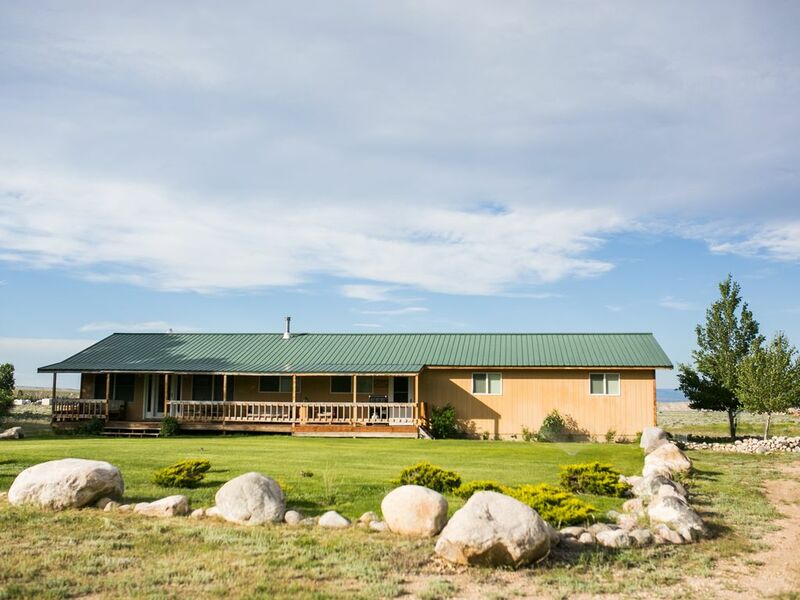 This beautiful house, nestled at the foot of the Beartooth Mountains, has 3 bedrooms and 2 baths. The Master bedroom has a queen bed and its own bath. The twin bedroom has a western motif. The full bedroom has lovely antique furniture. The large kitchen opens up to the living room and game room so the cook can participate in all the family activities. There are wood burning stoves in the game room and the living room, otherwise the house has central heat. The living room is huge with a dining room table that seats 10 and a sofa bed that will accommodate two more people. There is a long porch off the front of the house where you can relax and view the Majestic Beartooth Mountains as the wildlife passes by on the front lawn. The kids have tons of room to run around on the 20 acres or play Air-hockey in the game room. If you are interested in riding, I can arrange for someone to bring horses to the house or there are places to rent ATV's if you don't want to bring your own. You will be 30 miles away from historic Cody, Wyoming or Red Lodge, Montana. Drive the breathtaking Beartooth Highway. There is so much to do in this centrally located community! Cody and Red Lodge offer many adventures like river rafting or canoeing. There are numerous delicious restaurants to choose from. Whatever it is that you are looking to do Clark, Wyoming has it! We are cattle ranchers. We love our cows, chickens, horses and cats. Martin and Pam are retired, but you are never really retired when you own a ranch. We love to ride through the cows on our various properties. We grow alfalfa on our home property and we also have a vegetable garden. We both love to cook and have friends over. I moved here from California. I wanted to raise my son in a wholesome and healthy environment and it was the best decision I ever made. I moved from a small condo outside of Los Angeles to 20 acres in a small community with room to breath and a breathtaking view. My son thrived with the hunting, fishing, horseback riding, and all the hard work that goes with owning a home on 20 acres. This is not a place you will want to come to to watch TV or play video games. This is a place for you explore and have good old fashioned fun. 3 bdrm, 2 bth spacious home, sleeps 6-8. Hunt Elk (54), Antelope (80) , Big Horn Sheep (1), and deer (Region F, 105) or fish the famous Clark's Fork River. If you are hunting in Clark you should be staying in Clark. There is no hunting on the property itself, and we do not provide licenses. Licenses are obtained through Wyoming Game and Fish. You will enjoy sitting on the front porch and watching the wildlife pass by. Have your coffee on the front porch and look at the majestic Beartooth Mountain view while you plan your day, and there is much to plan. Cody and Red Lodge offer so many activities like river rafting, horseback riding, shops and restaurants, The Buffalo Bill Museum, Bus tours around Cody or Yellostone Park. You can also rent Jeeps or UTV's to tour the many trails. In the summer you will hear the gentle sound of water flowing by both sides of the house, whether you are sitting in the living room or in one of the bedrooms. The house is a great place to just relax and be quiet or entertain as there is room enough to feed 10 at the dining room table. So, you have the choice of quiet solitude or travel 30 miles in either direction and have all the people and activities you want. Most people come to enjoy the beauty or participate in all the activities in Clark. No one comes to Clark to watch TV or work on their computers so there is no WiFi in the house but there is WiFi provided in many restaurants and coffee houses. Beautiful scenery, great for hiking, ATV or UV, Horseback riding (we can arrange for horses to be brought to the house), biking, canoe or river raft, fishing, hunting, viewing animals. Beartooth Mountains view from front porch. Drive the scenic Beartooth Hwy or Chef Joseph Hwy. Both will take you to Yellowstone and are beautiful drives. Ski in Red Lodge or bring your snow mobiles. Beautiful areas to explore! There is a window air conditioner in the living room. Each room has a fan that you can place in the window, and if that is too noisy each room has a quiet ceiling fan. There is central heat and 2 wood burning stoves. The beds will be made before you arrive and towels will be provided. There is a washer and dryer but don't forget to buy some laundry detergent while you are buying your groceries. We also have a clothes line if you prefer to line dry your clothes. Large and open to the rest of the house so the cook can participate in all the activities. Air Hocky table, games and puzzles, keyboard and guitar. The game room is filled with board games and jigsaw puzzles. There is an Air-hockey table in the game room as well as an electric piano and a guitar. Huge lawn for kids to play on and a small lawn in the gated back yard. Long deck in the front. Small deck in the back. Grill on the front porch. Hunt Elk in area 54, Antelope in area 80, Big Horn Sheep in area 1, and deer in Region F, area 105 or fish the famous Clark's Fork River. If you are hunting in Clark you should be staying in Clark. There is no hunting on the property itself and we do not provide licenses. Hunting licenses are obtained through Wyoming Game and Fish Most people come to enjoy the beauty or participate in all the activities in Clark. No one comes to Clark to watch TV or work on their computers so there is no WiFi in the house but there is WiFi provided in many restaurants and coffee houses. We do not provide laundry detergent or hygiene products because of possible allergies. Please purchase these when you are buying your groceries. The house is very spacious, clean, comfortable and nicely decorated with a rustic cabin décor. My siblings, my wife and I enjoyed our stay there especially the beautiful mountain views from the large great room and the relaxing front porch. Cody and Yellowstone E and NE entrances are convenient within 1/2 hour to 1.5 hour drives. We highly recommend this house and hope it is available during our next trip to NW Wyoming. The rabbits provided daily entertainment as they were often grazing on the front lawn. Thank you Allen! Martin and I (and the rabbits) miss you all! Tucked away in the beauty of Wyoming's north-west, this is a beautiful place to rest, celebrate the beauty of nature, and enjoy quiet conversations with friends and family. The home has enough space for a large family, and is cozy enough for a romantic get-away. The scenery is breath-taking, and Sawtooth mountain provides an amazing setting for captivating sunsets. Enjoy!! Loved our visit to Clark! The house was clean, warm and cozy. It felt like we never left home. We could sight see all day and return to a welcoming home. Plenty of space without losing that cozy feeling. Very comfortable front porch with gorgeous views. We’ll be back! Thank you Dresden! Martin and I are looking forward to seeing you again! Oh my goodness, I love this place. I have done a decent amount of traveling, but this home offers so many surprises with its amount of beauty and peace. It's where you can go when you need to reconnect to what is really important. You feel like you can BREATHE there. But, that's not to say there isn't plenty to do as well! This location has so much to offer... horseback riding, ATV's, hiking, fishing, Yellowstone, and more. I really want to stress the beauty of the Clarks Fork Canyon just up the road. Plus, the drives on Chief Joseph and Beartooth Highways to or from Yellowstone are breathtaking! You really can't go wrong with this vacation spot. Pam and Martin are wonderful hosts! Thank you for sharing your home with us! Heaven on earth. Thank you, Meghan! We were so glad to have you at our home. And, yes, we agree that the Clark's Fork Canyon, Chef Joseph Hwy and Beartooth Hwy are one of our biggest attractions. We hope that you can join us again soon! Fish the Clark's Fork River. Hunt Elk in Area 54, Antelope in area 80, Big Horn Sheep in area 1, and deer in Region F Area 105. Horseback Rides in Cody at the museum or in the park. Or if you let me know, I can arrange for you to have someone bring horses to the house. Ski in Red Lodge! Or bring your snow mobiles for miles of beautiful scenery. Eat or Shop in Cody, Wyoming or Red Lodge, Montana both just 30 minutes away. Participate in the pig races at the Bearcreek Saloon. There is a Baptist and a Catholic Church and Monastery in Clark. We brand our calves in May, come and join us! Clark Jubilee is in June, rodeo, games, pot luck dinner and more. Most people come to enjoy the beauty or participate in all the activities in Clark. No one comes to Clark to watch TV or work on their computers so there is no WiFi in the house but there is WiFi provided in many restaurants and coffee houses. House Rules: 1. Please keep the back gate closed at all times or the deer will eat the flowers. 2. The garage will be locked at all times. 3. We ask that you leave the house the way it was found, wash your dishes and strip the beds before you leave. Place all sheets and towels in the laundry room. Remove food from the refrigerator, wipe down counter and stove tops. 4. Smoking is strictly prohibited. 5. We ask that you keep your paper trash separate from bottles, glass or cans. 6. We are on a septic system so please use caution when flushing. 7. Please turn all outside lights off upon retiring for the evening. 8. Parties are not permitted. 9. Keep all vehicles on the driveway. 10. Always cover your food in the microwave with the cover that is provided.